Who should not take Saxenda Pen Injector? What conditions does Saxenda Pen Injector treat? Tell your doctor right away if you have any serious side effects, including: signs of kidney problems (such as change in the amount of urine), yellowing eyes/skin, fast heartbeat, mental/mood changes (such as depression, thoughts of suicide), signs of low blood sugar (sudden sweating, shaking, fast heartbeat, hunger, blurred vision, dizziness, or tingling hands/feet). List Saxenda Pen Injector side effects by likelihood and severity. Before using this medication, tell your doctor or pharmacist your medical history, especially of: kidney disease, disease of the pancreas (pancreatitis), mental/mood disorders (such as depression, thoughts of suicide), certain stomach/intestinal disorders (gastroparesis, problems digesting food). Some products that may interact with this drug include: diabetes medications (such as insulin, sulfonylureas including glyburide). 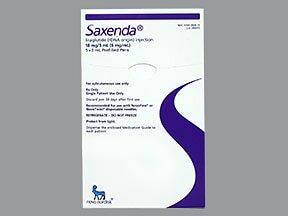 Are you taking Saxenda Pen Injector? Are you considering switching to Saxenda Pen Injector? How long have you been taking Saxenda Pen Injector?